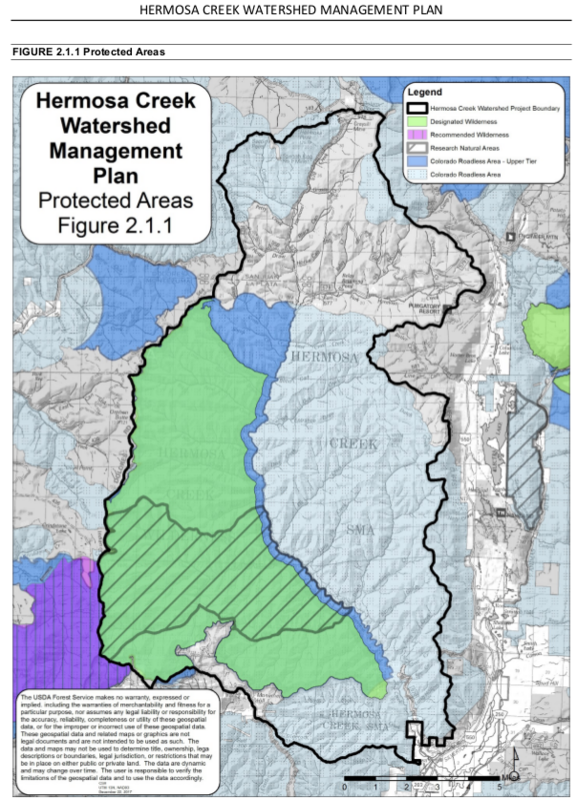 The San Juan National Forest has released the Final Hermosa Creek Watershed Management Plan. This is the “go-to” document for how the Hermosa Special Management Area and Wilderness will be managed. This document is different from the Environmental Analysis because it combines the proposed action with recently-signed decisions. It does not contain alternatives that were not chosen or much background information or rationale, which can be found in the EA. For additional information, please contact the Columbine Ranger District at 970-884-2512. Colorado Parks and Wildlife staffers prepare native Colorado River cutthroat trout for stocking north of Durango on July 27, 2017. Restoration of native trout reached another milestone on July 27 when 3,000 Colorado River cutthroat trout were stocked in streams about 30 miles north of Durango by Colorado Parks and Wildlife. The restoration project is being done in the Hermosa Creek drainage and is a joint project of CPW and the San Juan National Forest, with assistance from Trout Unlimited. So far, restoration work has been completed on three phases of the project which includes sections of the main stem of Hermosa Creek and East Hermosa Creek. One more phase remains that will take two more years to complete. 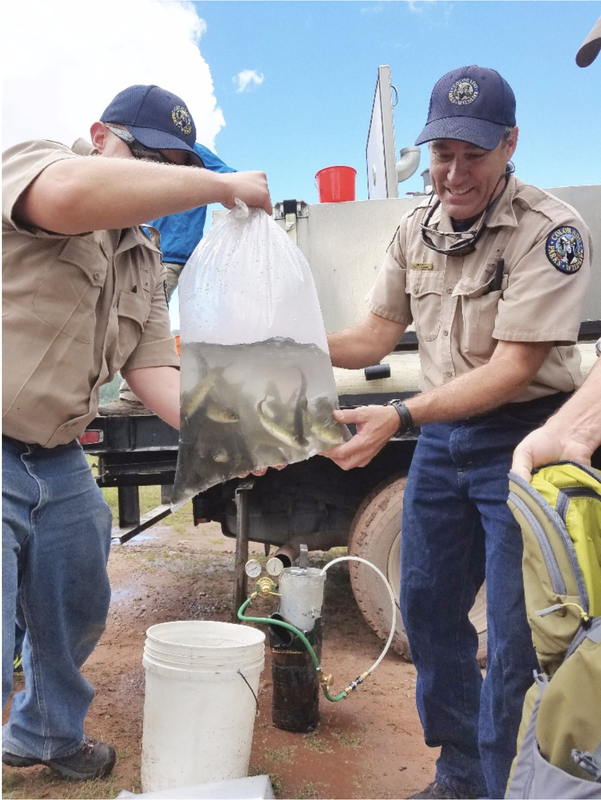 Last week about 50 volunteers helped to distribute the five-inch fish in about three miles of water in East Hermosa Creek, Relay Creek and Sig Creek. To restore native fish, the U.S. Forest Service has built two barriers on the creeks which block the passage of non-native rainbow and brook trout. Native cutthroats cannot compete with those fish in a stream. Following construction of the barriers, CPW treated the water to kill all fish in the stream. Generally, it takes two years for biologists to confirm that all fish have been eliminated. After that, native fish can be restocked. Besides building the barriers, the Forest Service has also made improvements along the streams to improve fish habitat. Fish are doing well on the section completed five years ago on Hermosa Creek, White said. A recent survey showed that more than 400 fish per mile now inhabit the creek. “We know the fish are reproducing in that section and we are very pleased with what we’re seeing,” White said. The last phase of the project will connect East Hermosa Creek with the main stem. The Forest Service is currently building another barrier just below the confluence of the two streams; treating the water to eliminate all fish will be done in 2018 and 2019. By 2020, if all goes as planned, nearly 25 miles of stream in the Hermosa Creek drainage will be home to the native trout. Hermosa Creek is an excellent spot for anglers to get off the beaten path for catch-and-release-fishing. Anglers are reminded that fishing in this area is by fly and lure only, and that all cutthroat trout caught in the area must be returned to the water immediately. To learn more about CPW’s work to restore native trout throughout the state, go to: http://cpw.state.co.us/learn/Pages/ResearchCutthroatTrout.aspx. Update: Here’s a photo gallery from The Durango Herald. The effort to restore Colorado River cutthroat trout in Hermosa Creek dates back to the early 1990s when wildlife managers used a natural waterfall on the creek’s east fork as a protective barrier. Colorado Parks and Wildlife cleared out non-native species of trout – specifically brook, brown and rainbows – using a short-lived, organic poison known as rotenone. And in their place, it released Colorado River cutthroat trout, giving the waterway to the native fish for the first time in probably 100 years. The magnitude of the cutthroat’s loss has never been truly quantified, but its range – which once spanned Colorado, New Mexico, Utah and Wyoming – was dramatically reduced, mostly because of habitat loss, overharvesting and competition with non-native species. Clay Kampf, a fisheries biologist for the San Juan National Forest, said the best estimates show the Colorado River cutthroat trout is now found in about 14 percent of its historic natural habitat. Facing the possibility of the U.S. Fish & Wildlife Service listing the Colorado River cutthroat trout as “endangered,” which would bring a host of restrictive protections, Colorado, Utah and Wyoming entered a three-state agreement to lead an aggressive reintroduction program. In the last decade, the state of Wyoming has restored more than 60 miles of Colorado River cutthroat habitat, with most of that occurring in the upper Green River drainage by the town of Big Piney. There, Mark Smith of the Wyoming Game and Fish Department said the population has been struggling since reintroduction. The fish haven’t spawned early enough, he said, which means they don’t grow big enough to survive winter. In Utah, the program has been wildly successful, with hundreds of miles of streams restored with their native species of trout, said Randy Oplinger of the Utah Division of Wildlife Resources. Oplinger said Utah has been the most ambitious of the three states, likely because of the fact many projects are located on federal lands managed by agencies open to large-scale restoration efforts. Once a final barrier is constructed this summer on Hermosa Creek, just below its confluence with the east fork, an effort to dedicate more than 23 miles solely to the cutthroat trout will almost be complete. Two decades ago, Hermosa Creek was recognized as an ideal place for a restoration project because of the creek’s outstanding water quality and because of its easy accessibility through Forest Service Road 578, which runs behind Purgatory Resort. After the waterfall near Sig Creek Campground was used as a natural blockade from non-native intrusion in the early 1990s, two more human-made barriers were built in 2007 and 2013. This summer, the U.S. Forest Service will begin construction on the final barrier at the Hermosa-east fork confluence to safeguard the waters above the blockade for the Colorado River cutthroat. CPW’s White said that in the segments of the creek that have already been repopulated with cutthroat, population trends are encouraging. He said a recent sweep a few years ago found about 400 to 600 fish per mile. With a successful stretch of river returned to its native species, wildlife managers are expecting Hermosa Creek to get a lot of use from excited anglers. The quest to set right altered habitats continues to have strong cultural and ecological justifications, said Noah Greenwald of the Centers for Biological Diversity. The Hermosa Creek restoration project is a coordinated effort between the U.S. Forest Service and Colorado Parks and Wildlife, as well as Trout Unlimited, which in total have spent more than a $1 million, Kampf said. It will take a few more years for the waters upstream of the forthcoming barrier to carry only cutthroats, as non-natives still need to be removed, but Kampf said it will be worth the wait. As local anglers, conservationists and wildlife managers get ready to celebrate another milestone in the restoration of Colorado River cutthroat trout to the upper reaches of Hermosa Creek, it is easy to forget that the effort, which dates back to the early 1990s, has its detractors. Some local residents, and many long-time summer visitors to the popular area tucked behind Purgatory, think all the fuss over the fish – one of three native Colorado subspecies of trout named for the distinctive crimson slashes found on each side of the lower jaw – has ruined a fine local fishing hole. From a short-term point of view, they have a point. The periodic poisoning of the creek to remove non-native trout, the building of barriers to keep non-natives downstream, the stocking of cutthroats and the rules against taking them for the frying pan have sent those seeking a stringer of fish further downstream, or elsewhere. 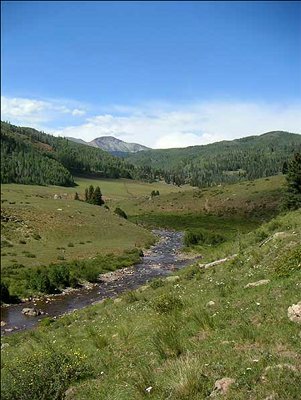 In 1992, the Colorado Division of Wildlife applied rotenone above the waterfall on the East Fork; not long after, Colorado River cutthroat were planted in the stream and the fish, estimated to occupy less than 15 percent of its original range on the tributaries of the Green and Colorado rivers, had a toehold in Hermosa headwaters once again. It was an important step in the effort to keep the U.S. 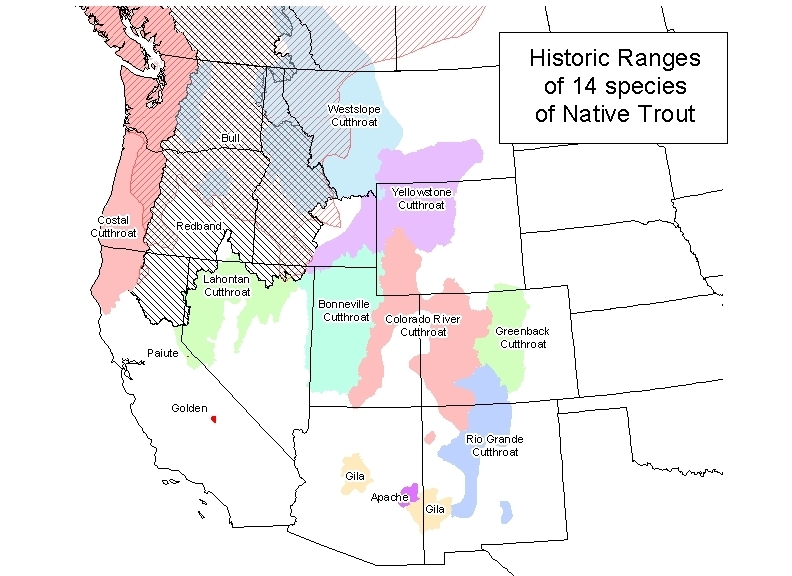 Fish and Wildlife Service from listing the fish as an endangered species, and mirrored similar restoration efforts on the fish’s native range in Utah and Wyoming. Since then, barriers have been built and the process repeated on the main stem upstream of Hotel Draw. With the pending completion this summer of a barrier at the confluence of the East Fork and the main stem, the native-cutthroat-only stretch will soon comprise the largest continuous stretch of Colorado River cutthroat habitat in the state. That story, and the Hermosa area’s more recent protected status, bode well for another rebounding native. Construction activities will begin in the Hermosa Creek Special Management Area on Monday, July 10, 2017 to erect a fish-migration barrier on Hermosa Creek as part of the ongoing Colorado River Cutthroat Trout Reintroduction Project. Trail users and visitors to the area should expect to encounter delays and closures until October 1, 2017. The barrier is being installed on the main stem of Hermosa Creek downstream of its confluence with the East Fork of Hermosa Creek. About one-half mile of the Hermosa Creek Trail from its northern trailhead must be widened to allow heavy equipment to access the construction site. The trail widening is temporary and will be rehabilitated to the extent possible. Tree removal is expected to be minimal. Throughout the construction project, trail users traveling in both directions may encounter temporary delays of up to one hour. Short-term closures lasting up to a full day are also possible, especially when heavy equipment is being moved in and out of the area. No more than four days of closures are expected during the three-month project, but construction schedules are subject to changing conditions. Public notices will be posted when trail closures are expected. The project is not expected to affect fishing, because flows will be bypassed above the construction site; however, some sedimentation is expected downstream. The barrier represents the final and most important phase of the Hermosa Creek Colorado River Cutthroat Trout Reintroduction Project, which began almost 30 years ago. The goal is to protect native cutthroat trout above the barrier from non-native fish located downstream. For more information, please contact the Columbine Ranger District at 970 884-2512 or Clay Kampf at 970-884-1403. The San Juan National Forest hired Durango contractors G2 and AJ Construction to complete 500 feet of streambank stabilization in preparation for reintroduction of native Colorado River cutthroat on a stretch of the creek where non-native fish have been removed. Under the direction of Kampf, Grady James, equipment operator with AJ Construction, spent September maneuvering rocks and logs into place to reinforce streambanks and create small waterfalls and deep pools. The goals were clean water and a diversity of habitat for all seasons. This fall’s water level was only about three to five cubic feet per second, which offered an opportune time to conduct improvements, but the project was designed for a wide diversity of flows. While spring flows of up to 40 to 50 cfs in the East Fork of Hermosa Creek threaten habitat by eroding the banks, very low flows in winter also endanger the fish. Buried logs are effective for stabilizing banks where the stream splits and creates shallow stretches that offer spawning habitat in the spring. But where the creek had divided into multiple channels, rocks were used to divert water back into the main channel to keep flows steady. Encouraging vegetation is also important for stream stabilization. 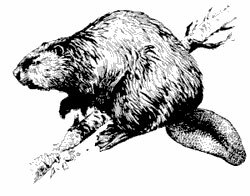 When the heavy equipment scooped up grass and forbs to make way for placement of rocks and logs, its giant claw replanted the native vegetation with the skill of a seasoned gardener. Kampf also hopes nature’s furry engineers will return to the area and help with recovery. The Forest Service will closely monitor the project area for three years, keeping an eye out for noxious weeds. Volunteers with the Durango Chapter of Trout Unlimited will help the agency later this fall to plant additional native grass and forb seeds and alder/willow cuttings along the banks to further revegetate the area. “Our goals are to improve water quality and mimic natural features that will aid in the conservation of the Colorado River cutthroat, which will, in turn, improve recreational fishing,” Kampf said. The multi-year project to restore native Colorado River cutthroat trout to more than 20 miles of the Hermosa Creek watershed is continuing this summer. The project is a cooperative effort of Colorado Parks and Wildlife, the U.S. Forest Service and Trout Unlimited. The Hermosa Creek project is one of the largest native trout restoration project ever done in the state. The work is critical for bringing this species back to western Colorado. Located about 30 miles north of Durango, wildlife biologists identified the Hermosa Creek area as a prime spot for restoration more than 20 years ago. The first project was completed on the upper East Fork of Hermosa Creek in 1992. Cutthroat trout now thrive in that section. A second part of the project was completed in 2013 on the main stem of Hermosa Creek above Hotel Draw; and the native trout are thriving in that section of water. All the projects include construction of rock barriers that prevent non-native trout from migrating into the restored sections of stream. Agency officials hope that the entire project will be completed by 2018. 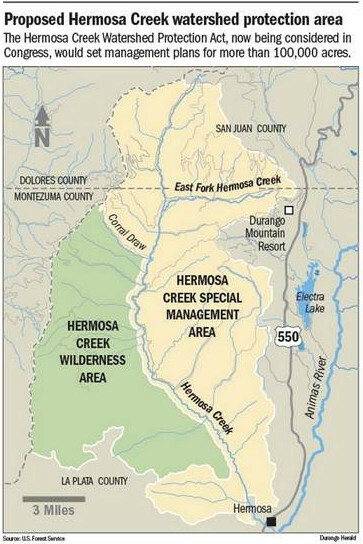 On Aug. 4-5, crews will apply an organic piscicide to a 2-mile long section of East Hermosa Creek below Sig Creek Falls to just above the confluence with the main stem of Hermosa Creek. The piscicide, Rotenone, will eliminate non-native fish species—primarily brook trout. Rotenone has been used for years throughout the world for aquatic management projects because it breaks down quickly in the environment and poses no threat to terrestrial wildlife or humans. CPW biologists also use a neutralizing agent just below the treatment area to prevent any fish kills downstream. Short sections of Relay Creek and Sig Creek above will also be treated. The work area will be closed to the public during the operation. An administrative campsite will be reserved for use by CPW and USFS employees during the treatment work. Signs are posted in the closed areas and the public is asked to observe the closure. Visitors below the treatment area might see rust-colored water–-that is the color of the neutralizing agent. Anglers will still have full access to Hermosa Creek and the upper section of East Hermosa Creek. Any cutthroat trout caught must be returned to the water. Because of the complexity of the habitat along the East Fork, the section will most likely be treated again next summer to assure elimination of non-native fish. If all goes as planned, native cutthroats will be stocked into the stream late next summer. While the project is scheduled for the first week of August, project managers will be keeping an eye on the weather as recent rains have swelled the creeks in the area. If the water is running too high, the project could be delayed until next summer. The Hermosa Creek project is one of the most important native cutthroat trout restoration endeavors in Colorado. After completion of the lower East Fork section, more work will be done in the coming years on the main branch of Hermosa Creek. The end-point of the effort will be just below the confluence of the East Fork and Hermosa Creek. Every year Colorado Parks and Wildlife deploys significant resources for native trout restoration efforts. Colorado’s native trout include: the Colorado River cutthroat trout; the Rio Grande cutthroat trout; and the Greenback cutthroat trout. In a win for both conservationists and snowmobile riders, more than 100,000 acres of wilderness in southwest Colorado soon will gain an extra layer of protection under legislation that passed the U.S. Senate on Friday. The safeguards for the Hermosa Creek area, near Durango, were included as part of a broad defense bill that sailed through the Senate by an 89-11 vote. The measure now heads to President Barack Obama, who is expected to sign it. “The cooperation, compromise and hard work put into this bill over a number of years by a diverse group of Coloradans should serve as a model for Washington,” U.S. Sen. Michael Bennet, D-Colo., said in a statement. Its passage caps the end of a legislative journey begun years ago when community leaders near Durango began debating how best to protect the Hermosa Creek area while allowing its use by backpackers, anglers and snowmobile riders. That debate led to a compromise land-use proposal that became the basis of federal legislation introduced last year by Bennet and fellow lawmakers U.S. Sen. Mark Udall, D-Colo., and U.S. Rep. Scott Tipton, R-Cortez. Its prospects of becoming law looked good until September, when Tipton sought to amend the legislation as it moved through the House. Broadly, the changes he supported would have “locked in” snowmobile trails in the Molas Pass area of Hermosa Creek while raising the possibility of widespread mining throughout the region. Tipton said he backed the revisions to help local business. But the eleventh-hour changes threatened to sink the legislation, as they came only a few weeks before lawmakers were to conclude their business for the 113th session of Congress. The move triggered another round of negotiation between Bennet and Tipton, who ultimately agreed to new language that restricted mining in nearly all of the new preserve while providing a small amount of flexibility in the routing of snowmobile trails. “The people of southwest Colorado who have dedicated so much time and effort as a community to help craft and support this legislation that will protect the Hermosa Creek Watershed and the multiple uses of that land have reason to celebrate today,” Tipton said in a statement. An aide to Bennet said the legislation would take effect as soon as Obama signs the bill. As written, it sets aside about 38,000 acres in the Hermosa Creek watershed as wilderness — a designation that prohibits roads, mining and mechanized vehicles — and transforms another 70,650 acres into a “special management area” that would support activities from ATV riding to “selective timber harvesting,” according to a synopsis of the bill. Mining would be allowed on roughly 2,400 acres of the new preserve. “Today is an historic and celebratory day for Colorado. Thanks to the diligent work of U.S. Senator Michael Bennet, U.S. Representative Scott Tipton, and local stakeholders in southwest Colorado, we are poised to add 108,000 acres of protected lands, including 37,236 acres of new wilderness, to the Hermosa Creek Watershed near Durango. This stunning area will now be protected to continue providing vital wildlife habitat, unparalleled recreation opportunities, and clean water for the region for generations to come. More Hermosa Creek coverage here and here.